‘Staycations’ may be a dreaded consequence of the recent economic downturn but for Christopher Shannon, it gave him the opportunity to let his imagination run riot. His S/S11 collection was inspired by nostalgia for holidays he’d never been on, from holiday snaps of Nairobi to the dancehalls of Kingston. His raison d’etre is a witty, super cool take on sportswear – a camouflage print came literally emblazoned with ‘CAMO’ on it, techno mesh trim and nylons was contrasted with crisp cotton shirts and he experimented with creating a tufting effect on jeans. As always his accessories were impeccable – from the enormous backpacks to the ‘Frankenstein’ pieces cobbled from leftover bits from his studio. If this is what staycations are like – roll on next summer. Dazed Digital: So the idea behind the collection was basically a ‘staycation’? Christopher Shannon: Basically I’ve been in the same studio for ages. So it was nice to work on something that makes you feel a bit cheerful. Christopher Shannon: When I work on things, I like to offset them. Because the bags we did were so polished and done I wanted to do some neckpieces that were horrific so we collected as many horrible things as we could find and put it all together and we just kept going. DD: Are there certain subcultures that you keep coming back to in your work? 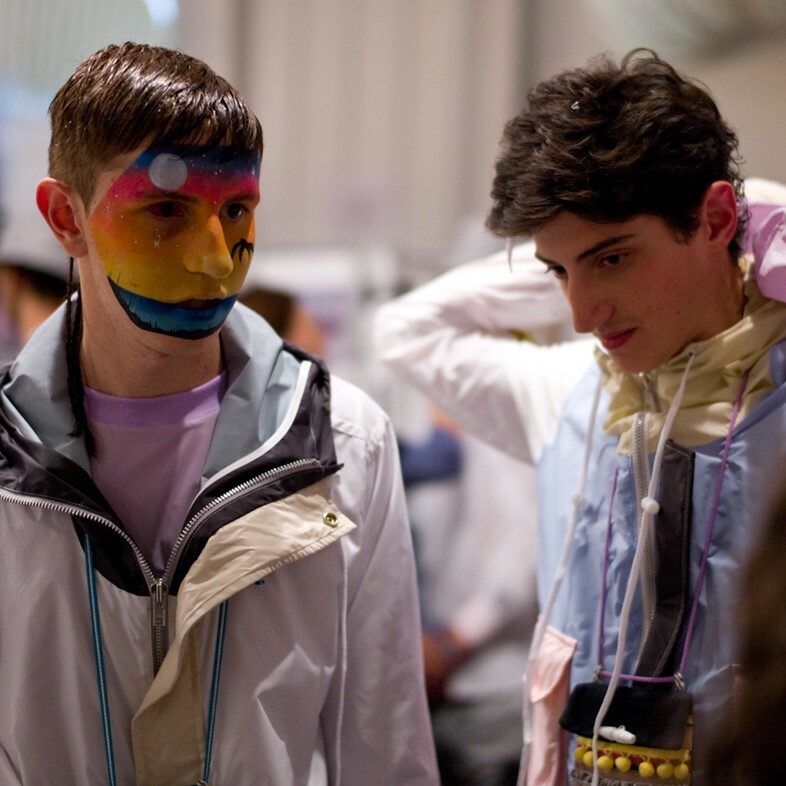 Christopher Shannon: For summer I think about kids that I grew up with – that adds an element of fun to it. There are parts that are quite grown up but the anoraks are a bit more playful. Living in East London I do come back to certain things. Christopher Shannon: We were listening to loads of dancehall while we were making the collection – there’s a festival in Kingston, we were watching loads of videos of that just to get in the mood. I listened to a lot of reggae when I was little and it was nice to go back to that. Christopher Shannon: I guess I felt more open to my own ideas. The things I take the risks with I end up liking the most at the end, even if I hate them along the way like those horrible bags! It goes back to working with Judy Blame – I wanted to do something almost like an homage to him but taking things that were maybe too horrific for even Judy.